A strong service strategy is important to the success of any business and a good service strategy begins with good service to internal customers. The role of HR in any organization is to serve their internal customers - the employees. While HR strives to manage the human capital aspect of their organizations accordingly, their focus is also on meeting the needs of employees and their managers. Thus, it is important to understand what your internal customers expect from you. This workshop explores the importance of internal customer satisfaction, ensuring high levels of customer satisfaction so that HR professionals can continually measure and monitor the needs of its various customers and using quality customer service to build a HR brand! • To better understand the importance of internal customer satisfaction. • To develop a customer service mentality in HR. • To learn more about various cognitive behaviors and how to handle them. • To use effective verbal and non-verbal communication skills when handling their internal customers. • To explore various tools to measuring internal customers satisfaction. • To understand why internal customer crisis happen and how to manage them. Carina is a Certified Corporate Trainer specializes in communication skills training and an expert in voice coaching. Her areas of focus include Business Etiquette, Problem Solving, Conflict Management, Interpersonal Skills, Assertive Skills, Goal Setting and Personal Effectiveness, Customer Service and Handling Difficult People/Customers. 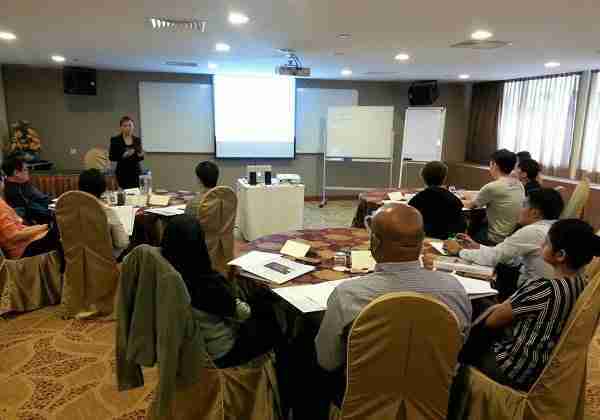 She has conducted numerous workshops for both MNCs and SMEs in the past years and had been interviewed in the media such as Singapore’s News Radio 93.8 Live and Pop Radio Station 933. Carina also contributes articles to the Straits Times Career Guide. A powerful presenter, Carina takes keen interest in research and development of workshops, keeping in mind participants’ various organizational behaviours and work habits. Her conviction with regard to potential in every human being to excel beyond his imagination is very strong and forms the basis of her training. The key to success is the belief in ourselves. She evokes a positive self-response within individuals so that they start believing in their own capabilities. It gives her immense pleasure to witness her audience’s paradigm shift during and after the workshops. Her mission in life is to assist individuals to flourish and progress even during extreme stress and adverse circumstances and to be a source of positivity and inspiration for the community and colleagues around them. Carina has a Degree in Business & Human Resource Management. She also has Diplomas in Communication Studies, Advertising, Business Administration, Image Consulting, and in Teaching English to Speakers of Other Languages (TESOL), as well as a Professional Diploma in Cognitive Behavioural Therapy, a Certificate in Practical Counseling as well as an Advanced Certificate In Training & Assessment (ACTA). Carina is a Certified Master Life Coach and NLP Practitioner and is effectively bilingual in English, Mandarin and local dialects.